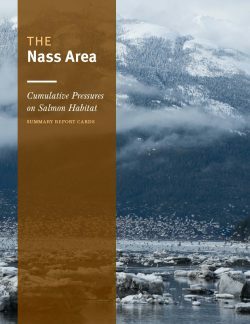 The Pacific Salmon Foundation (PSF) is pleased to announce the release of The Nass Area: Cumulative Pressures on Salmon Habitat (Summary Report Cards). Through direction from the Nisga’a Lisims Government, and in collaboration with the Gitanyow, Gitxsan, and Lax Kw’alaams First Nations, Fisheries and Oceans Canada, BC Ministry of Environment, ESSA Technologies, and other local experts, the PSF coordinated an assessment of landscape-scale pressures and the resulting risks to salmon habitat in the Nass Area of northern British Columbia. The “Nass Area” encompasses the Nass River watershed along with watersheds draining into Portland Canal and Observatory Inlet. This project assessed risk to salmon habitats posed by human and environmental pressures in the region. Using the best available data, a “report card” was generated for each geographically and genetically distinct Nass salmon populations (called Conservation Units under Canada’s Wild Salmon Policy). This type of coarse-scale assessment is useful for building a common understanding of the pressures on freshwater salmon habitats and for informing land-use planning decisions and developing strategies that mitigate risks to freshwater salmon habitat. More information about the project, as well as links to the full technical report, can be found here.